11 in two suborders, see text. The octopus (Greek Ὀκτάπους, “eight-legs”) is any cephalopod (class Cephalopoda, phylum Mollusca) belonging to the order Octopoda. An octopus is characterized by having eight arms and simple suckers without secondary armature (O'Shea 2006). The term octopus may also refer to only those creatures in the genus Octopus. Like all cephalopods, octopuses have bilateral symmetry, a prominent head, and a modification of the mollusk foot into the form of arms or tentacles surrounding the mouth, which has beak-like jaws. Octopuses belong to the subclass Coleoidea along with squids, cuttlefish, and extinct belemites. They differ from squids and the squid-like cuttlefish because squids and cuttlefish at some point in their life cycle have eight arms and two tentacles, whereas octopuses have eight arms and no tentacles. (Tentacles tend to be longer than arms and usually have suckers as their tips only.) Furthermore, while octopuses are characterized by simple suckers, the suckers of squids also are armed by hooks or sucker rings (O'Shea 2006). Some squid species lose their tentacles in post-larval stages, and thus the adult only has eight arms like the octopus (O'Shea 2006). Octopuses not only contribute to the food chains in ocean environments, but contribute many values to humans, including as a food delicacy, and as creatures whose intelligence, movements, camouflage, beauty, power, and defense and predatory techniques have fascinated human beings for thousands of years. All cephalopods are marine organisms. Octopuses inhabit many diverse regions of the ocean, especially coral reefs. In the larger sense of the term, there are about 300 different octopus species, which is over one-third of the total number of cephalopod species. Some authoritative sources consider octopuses to be the only acceptable plural form of octopus, while other sources also recognize octopi and rarely octopodes. Octopuses is the most common form, but Merriam-Webster Dictionary accepts octopi as an alternative form, and the Oxford English Dictionary (Simpson and Weiner 1989) lists octopuses, octopi, and octopodes in order of descending frequency of use. The term octopod (either plural octopods and octopodes can be found) is taken from the taxonomic order octopoda but has no classical equivalent. Fowler's Modern English Usage (Fowler 2003) states that "the only acceptable plural in English is octopuses,” and that octopi is misconceived and octopodes pedantic. Octopi derives from the mistaken notion that octōpūs is a second declension Latin noun, which it is not. Rather, it is Greek, from oktṓpous (ὀκτώπους), gender masculine, whose plural is oktṓpodes (ὀκτώποδες). If the word were native to Latin, it would be octōpēs (“eight-foot”) and the plural octōpedes, analogous to centipedes and mīllipedes, as the plural form of pēs (“foot”) is pedes. The Oxford American College Dictionary (2002) similarly states that the standard plural is octopuses, but also finds acceptable octopodes, since the word comes from Greek and the Greek plural form is octopodes. But, it is noted, "this is used so infrequent that people mistakenly create the erroneous plural form octopi, formed according to Latin plurals." The collective form octopus is usually reserved for animals consumed for food. Octopuses are characterized by their eight arms (not tentacles), usually bearing suction cups. These arms are a type of muscular hydrostat. Unlike most other cephalopods, the majority of octopuses—those in the suborder most commonly known (Incirrata)—have almost entirely soft bodies with no internal skeleton. They have neither a protective outer shell like the nautilus, nor any vestige of an internal shell or bones, like cuttlefish or squids. A beak, similar in shape to a parrot's beak, is their only hard part. This enables them to squeeze through very narrow slits between underwater rocks, which is very helpful when they are fleeing from moray eels or other predatory fish. The octopuses in the less familiar Cirrata suborder have two fins and an internal shell, generally lessening their ability to squeeze into small spaces. Octopuses have a relatively short life span, and some species live for as little as six months. Larger species, such as the North Pacific Giant Octopus, may live for up to five years under suitable circumstances. However, reproduction is a cause of death: males can only live for a few months after mating, and females die shortly after their eggs hatch, for they neglect to eat during the roughly one-month period spent taking care of their unhatched eggs. Octopuses have three hearts. Two gill hearts pump blood through each of the two gills, while the third pumps blood through the body. Octopus blood contains the copper-rich protein hemocyanin for transporting oxygen. Less efficient than the iron-rich hemoglobin of vertebrates, the hemocyanin is dissolved in the blood plasma instead of being bound in red blood cells and gives the blood a blue color. Octopuses draw water into their mantle cavity where it passes through its gills. As mollusks, octopuses have gills that are finely divided and vascularized outgrowths of either the outer or the inner body surface. An octopus has a highly complex nervous system, only part of which is localized in its brain. Two-thirds of an octopus's neurons are found in the nerve cords of its arms, which have a remarkable amount of autonomy. Octopus arms show a wide variety of complex reflex actions arising on at least three different levels of the nervous system. Some octopuses, such as the mimic octopus, will move their arms in ways that emulate the movements of other sea creatures. In laboratory experiments, octopuses can be readily trained to distinguish between different shapes and patterns. They have been reported to practice observational learning (BBC 2003), although the validity of these findings is widely contested on a number of grounds (Hamilton 1997; Stewart 1997). Octopuses have also been observed in what some have described as play: repeatedly releasing bottles or toys into a circular current in their aquariums and then catching them (Mather and Anderson 1998). Octopuses often break out of their aquariums and sometimes into others in search of food. They have even boarded fishing boats and opened holds to eat crabs (Smithsonian 2006). In some countries, octopuses are on the list of experimental animals on which surgery may not be performed without anesthesia. In the United Kingdom, cephalopods such as octopuses are regarded as honorary vertebrates under the Animals (Scientific Procedures) Act 1986 and other animal cruelty legislation, extending to them protections not normally afforded to invertebrates. A common belief is that when stressed, an octopus may begin to eat its own arms. However, limited research conducted in this area has revealed that the cause of this abnormal behavior, called autophagy, may be a virus that attacks the octopus's nervous system. Thus, this behavior may be more correctly labeled as a neurological disorder. Three defensive mechanisms are typical of octopuses: ink sacs, camouflage, and autotomising limbs. Most octopuses can eject a thick blackish ink in a large cloud to aid in escaping from predators. The main coloring agent of the ink is melanin, which is the same chemical that gives humans their hair and skin color. This ink cloud dulls smell, which is particularly useful for evading predators that are dependent on smell for hunting, such as sharks. An octopus's camouflage is aided by specialized skin cells which can change the apparent color, opacity, and reflective ability of the epidermis. Chromatophores contain yellow, orange, red, brown, or black pigments; most species have three of these colors, while some have two or four. Other color-changing cells are reflective iridophores, and leucophores (white) (Meyers 2006). This color-changing ability can also be used to communicate with or warn other octopuses. The very venomous blue-ringed octopus becomes bright yellow with blue rings when it is provoked. When under attack, some octopuses can detach their own limbs, in a similar manner to the way skinks and other lizards detach their tails. The crawling arm serves as a distraction to would-be predators; this ability is also used in mating. A few species, such as the mimic octopus, have a fourth defense mechanism. They can combine their highly flexible bodies with their color changing ability to accurately mimic other, more dangerous animals such as lionfish, sea snakes, and eels. They have also been observed changing the texture of their mantle in order to achieve a greater camouflage. The mantle can take on the spiky appearance of seaweed, or the scraggly, bumpy texture of a rock, among other disguises. When octopuses reproduce, males use a specialized arm called a hectocotylus to insert spermatophores (packets of sperm) into the female's mantle cavity. The hectocotylus, usually the third right arm, detaches from the male during copulation. Males die within a few months after mating. In some species, the female octopus can keep the sperm alive inside her for weeks until her eggs are mature. After they have been fertilized, the female lays about 200,000 eggs (this figure dramatically varies between families, genera, species, and also individuals). The female hangs these eggs in strings from the ceiling of her lair, or individually attaches them to the substratum depending on the species. The female cares for the eggs, guarding them against predators, and gently blowing currents of water over them so that they get enough oxygen. The female does not eat during the roughly one-month period spent taking care of the unhatched eggs. At around the time the eggs hatch, the mother dies and the young larval octopuses spend a period of time drifting in clouds of plankton, where they feed on copepods, larval crabs, and larval seastars until they are ready to sink down to the bottom of the ocean, where the cycle repeats itself. This is a dangerous time for the larval octopuses; as they become part of the plankton cloud they are vulnerable to many plankton eaters. In some deeper dwelling species, the young do not go through this period. Octopuses have keen eyesight and image-focusing, vertebrate-like eyes. Although their slit-shaped pupils might be expected to afflict them with astigmatism, it appears that this is not a problem in the light levels in which an octopus typically hunts. Surprisingly, although they can adjust color to aid in camouflage, they do not appear to have color vision; however, they can distinguish the polarization of light. Attached to the brain are two special organs, called statocysts, that allow the octopus to sense the orientation of its body relative to horizontal. An autonomic response keeps the octopus's eyes oriented so that the pupil slit is always horizontal. Octopuses also have an excellent sense of touch. The octopus's suckers are equipped with chemoreceptors so that the octopus can taste what it is touching. The arms contain tension sensors so that the octopus knows whether its arms are stretched out. However, the octopus has a very poor proprioceptive sense. The tension receptors are not sufficient for the octopus brain to determine the position of the octopus's body or arms. (It is not clear that the octopus brain would be capable of processing the large amount of information that this would require; the flexibility of an octopus's arms is much greater than that of the limbs of vertebrates, which devote large areas of cerebral cortex to the processing of proprioceptive inputs.) As a result, the octopus does not possess stereognosis; that is, it does not form a mental image of the overall shape of the object it is handling. It can detect local texture variations, but cannot integrate the information into a larger picture. The neurological autonomy of the arms means that the octopus has great difficulty learning about the detailed effects of its motions. The brain may issue a high-level command to the arms, but the nerve cords in the arms execute the details. There is no neurological path for the brain to receive feedback about just how its command was executed by the arms; the only way it knows just what motions were made is by observing the arms' visually. Octopuses move about by crawling or swimming. Their main means of slow travel is crawling, with some swimming. Octopuses crawl by walking on their arms, usually on many at once, on solid surfaces, while supported in water. Octopuses' only means of fast travel is called jet propulsion. In jet propulsion, oxygenated water is taken into the mantle cavity, and through muscular contraction of this cavity, the spent water is expelled through the hyponome (created by a fold in the mantle). Motion is usually backward as water is forced out anteriorly through the hyponome, but direction can be controlled somewhat by pointing it in different directions. This is a very energy-consuming way to travel compared to the tail propulsion used by fish, and is generally slow (although squids swim at a pace comparable to fish). Octopuses' fastest movements only occur when provoked by hunger or if in danger. Because the rate at which oxygen is transported to the blood is an estimated 4 percent in octopuses, it gives them a high disadvantage in the wild for having poor stamina. Humans utilize octopuses as food as well as display them live in public and private aquariums. Octopus is a common ingredient in Japanese cuisine, including sushi, takoyaki, and Akashiyaki. Some small species are sometimes eaten alive as a novelty and health food (mostly in South Korea). Okuzumi and Fujii (2000) report that cephalopod protein in general is considered to be low calorie and includes unsaturated fatty acids, which are considered to have health benefits, including lowering the risk of heart disease. An octopus escaping an aquarium through a thin crack. Though octopuses can be difficult to keep in captivity, some people keep them as pets. 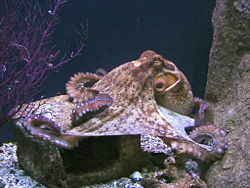 Octopuses often escape even from supposedly secure tanks, due to their intelligence, problem-solving skills, mobility, and lack of rigid structure. The variation in size and life span among octopus species makes it difficult to know how long a new specimen can naturally be expected to live. That is, a small octopus may be just born or may be an adult, depending on the species. By selecting a well-known species, such as the California two-spot octopus, one can choose a small octopus (around the size of a tennis ball) and be confident that it is young with a full life ahead of it. Octopuses are also quite strong for their size. Octopuses kept as pets have been known to open the covers of their aquariums and survive for a time in the air in order to get to a nearby feeder tank and gorge themselves on the fish there. They have also been known to catch and kill some species of sharks. Young et al. (1996) report that the classification of modern cephalopods is "unstable," with various authorities suggesting "highly variable" arrangements. The following is based on their classification of the extant octopuses and their placement within Cephalopoda. ↑ United Kingdom Animals (Scientific Procedures) act of 1986. BBC. 2003. Octopus twists for shrimps. BBC. Retrieved January 23, 2007. Hamilton, G. 1997. What is this octopus thinking? New Scientist June 7, 1997. Mather J. A., and R. C. Anderson. 1998. What behavior can we expect of octopuses? In The Cephalopod Page, edited by J. B. Wood. http://www.thecephalopodpage.org. Retrieved January 23, 2007. Okuzumi, M, and T. Fufii, eds. 2000. Nutritional and Functional Properties of Squid and Cuttlefish. Japan: National Cooperative Association of Squid Processors. Oxford University Press. 2002. Oxford American College Dictionary. New York: G. P. Putnam's Sons. ISBN 0399144153. Simpson, J., and E. Weiner, eds. 1989. Oxford English Dictionary, 2nd ed. Clarendon Press. ISBN 0-19-861186-2. Smithsonian. 2006. Giant Octopus: Mighty but secretive denizen of the deep. Smithsonian National Zoological Park/Friends of the Zoo. Retrieved January 23, 2007. Stewart, D. 1997. Armed but not dangerous: Is the octopus really the invertebrate intellect of the sea? National Wildlife 35(2). Young, R. E. 2006. Nautiloidea. Nautilidae Blainville 1825. Pearly nautiluses. Tree of Life Web Project, http://tolweb.org. Retrieved January 23, 2007. Young, R. E., M. Vecchione, and K. M. Mangold. 1996. Cephalopoda Cuvier 1797. Octopods, squids, nautiluses, etc. Tree of Life Web Project, http://tolweb.org. Retrieved January 23, 2007. This page was last modified on 12 February 2015, at 16:29.